Start the new year with a new cookie recipe. Photo courtesy GoBoldWithButter.com. Whether for dessert on New Year’s Eve or a special snack on New Year’s Day, we like to start the new year with a new cookie recipe—something different and exciting that we never get around to during the year, something perhaps a bit more laborious. 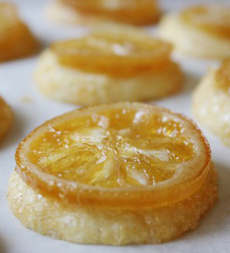 This French shortbread cookie, topped with a beautiful candied lemon slice, is something special. The base is a vanilla sablé (classic French shortbread): butter, sugar and vanilla. The recipe makes about 4 dozen cookies depending on size. 1. SLICE lemons into thin, even rounds about 1/8-inch thick, using a sharp knife. Try to slice evenly and take care to keep as much of the flesh intact as possible. Discard ends, carefully remove and discard any seeds. 2. BRING 1¾ cups water and 1 cup sugar to a boil, stirring until sugar is dissolved. Add sliced lemons and bring back to a gentle boil. Reduce heat as low as possible to maintain a gentle simmer, and simmer for 20 minutes. Remove pan from heat, cover and let sit at room temperature at least 4 hours or overnight. Gently drain the lemons and discard the liquid (it is rather bitter). 3. BRING remaining 2 cups sugar, 1½ cups water and 2 tablespoons corn syrup to a boil, stirring until sugar is dissolved. Add lemon slices and bring back to a gentle boil. Reduce heat as low as possible to maintain a gentle simmer and simmer for 15 minutes. Remove pan from heat, cover and let sit at room temperature at least 4 hours or overnight. 4. BRING same mixture back to boil and repeat this process 2-3 more times until lemon rind is tender and translucent, adding ¼ cup to ¾ cup water as needed to keep syrup liquid. If syrup becomes too thick, it may begin to caramelize, which should be avoided. 5. REMOVE lemon slices from syrup and spread out evenly on a wire rack set over a sheet pan. Let dry for at least 1 hour or overnight. Note: If you care to save the leftover syrup, it makes a rather nice drink mixed with sparkling water, or mixed with gin, tequila or vodka. 1. 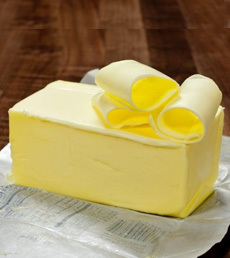 MIX butter on low speed until smooth and creamy, in a standing mixer fitted with paddle attachment or in a large bowl with a hand mixer, about 1 minute (you don’t want it to get light and fluffy). 3. DIVIDE dough in 2 or 3 pieces and shape each piece into log slightly smaller in diameter than your lemon slices (the dough will spread slightly during baking). Wrap logs in plastic wrap and roll on counter to round out the edges. 4. REFRIGERATE for at least 3 hours until firm. At this point the dough can be frozen, tightly wrapped, for up to 2 months. Good butter is expensive, but it makes all the difference in the flavor of cookies. Photo courtesy Beurremont. 1. POSITION oven racks in top and bottom thirds of the oven and preheat to 325°F. Line two sheet pans with parchment paper or silicone baking mats. 2. WHISK remaining egg white with a ½ teaspoon water to combine. Unwrap one dough log and brush lightly and evenly with the egg wash. Sprinkle about ¼ cup coarse sanding sugar around log and gently roll dough to coat, patting sugar where necessary until evenly coated. Using a sharp knife, cut dough into ½-inch thick rounds, turning the roll as your slice to keep the cookies round, and place on the prepared sheet pans, leaving about 1 inch between rounds. 3. BAKE cookies for 9 minutes until they just begin to set but haven’t yet browned. 4. TOP each cookie with a candied lemon slice then return to oven, rotating pans, and continue to bake until the cookies are slightly firm to the touch and golden brown on the bottom, about 8-10 additional minutes. 5. COOL cookies completely on sheet pans. 6. PACK in airtight container with wax or parchment paper between layers and store at room temperature for up to 4 days. Find many more scrumptious recipes at GoBoldWithButter.com. Find more of our favorite cookie recipes on TheNibble.com.